Chris designed these innovative ladder-like steps to access Kathleen’s office over the master bedroom. 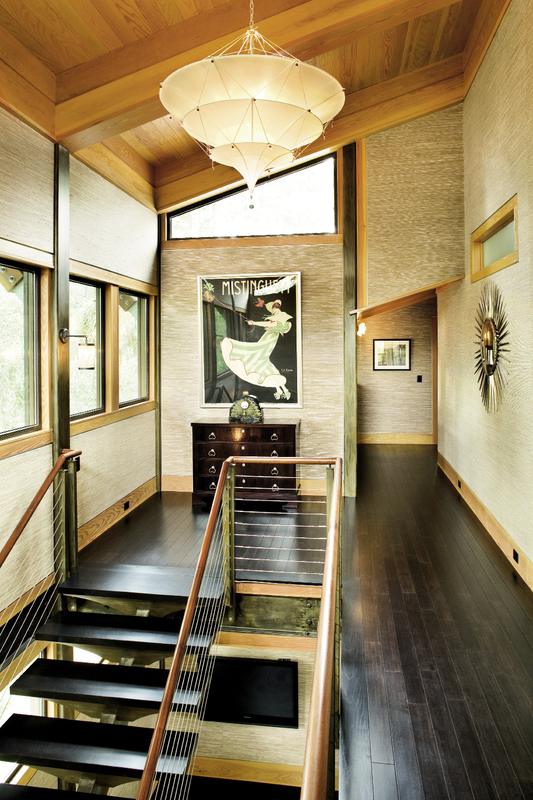 A bank of windows and a Fortuny pendant shade ensure the upstairs hall—with its angled roofline—receives ample light. the pair in their open kitchen, anchored by stainless steel upper cabinetry. 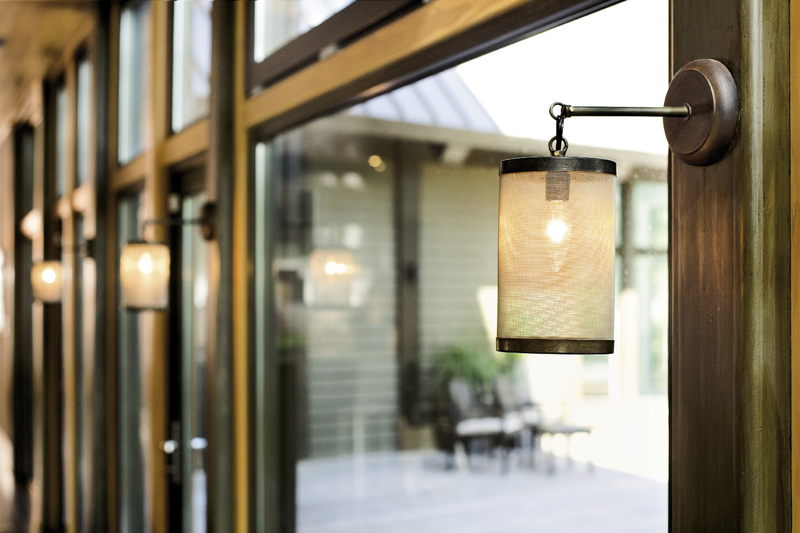 Hand-forged Italian lanterns warm the rear wall of windows. Cypress ceiling paneling, bamboo floors, stacked stone, and earthy grasscloth offset the contemporary structure’s hard edges. Kathleen Parramore knows where the grass is greener. Where the golf is good, and biking and kayaking routes don’t often repeat themselves. 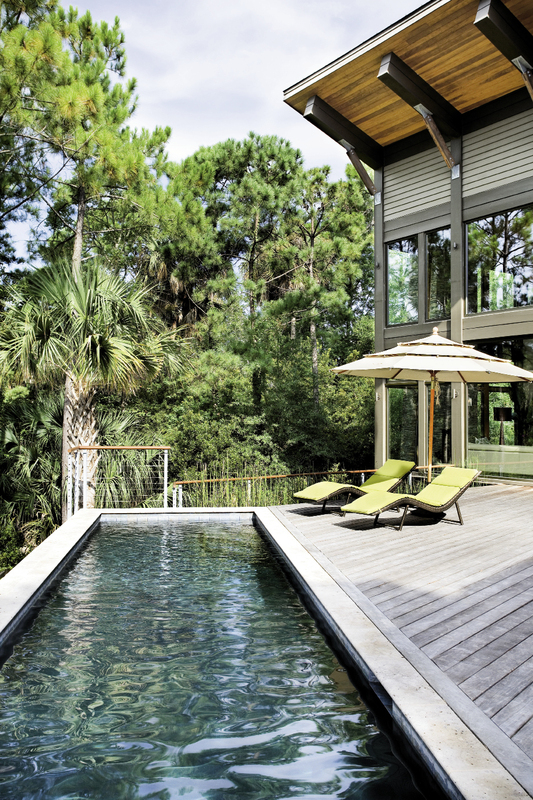 Where a glass house can get ample cover via towering oaks and magnolias, and a quiet lagoon out back is as good a water view as any. Certainly not. And even after that under-the-radar island of old morphed into Kiawah all grown up—with a world-class hotel and PGA street cred—it never lost its top spot on that all-important list. The other thing they knew? Their hidden home behind the brush would be a contemporary one. “We’d lived in a Manhattan brownstone for 12 years, where our only avenue for modern was in the furnishings,” she adds. the lagoon. We wanted that in full view,” Kathleen notes. 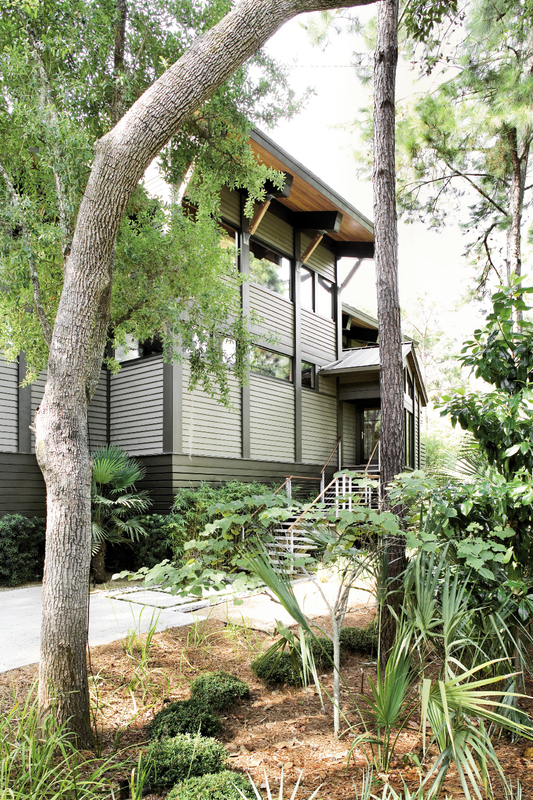 With the addition of a metal roof and oversize eaves (stretching a full six feet to add a cool mid-century design element and help block the sun), Chris and the pair had their start. But they also had a dilemma common among those framing a house with all that good, sturdy steel. 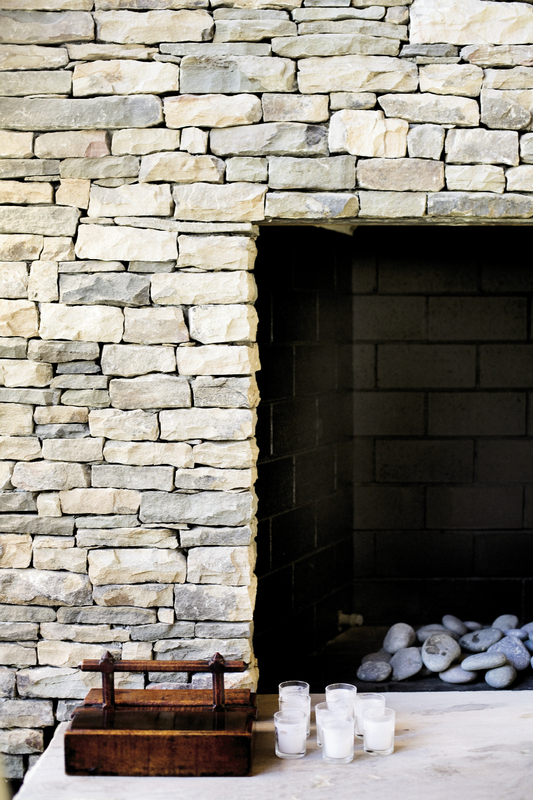 How do you keep the interior from feeling cold or severe? The ceiling, then, was softened with light, cypress paneling; the floors laid with stained bamboo; and a soaring, 27-foot chimney built from flat stones. 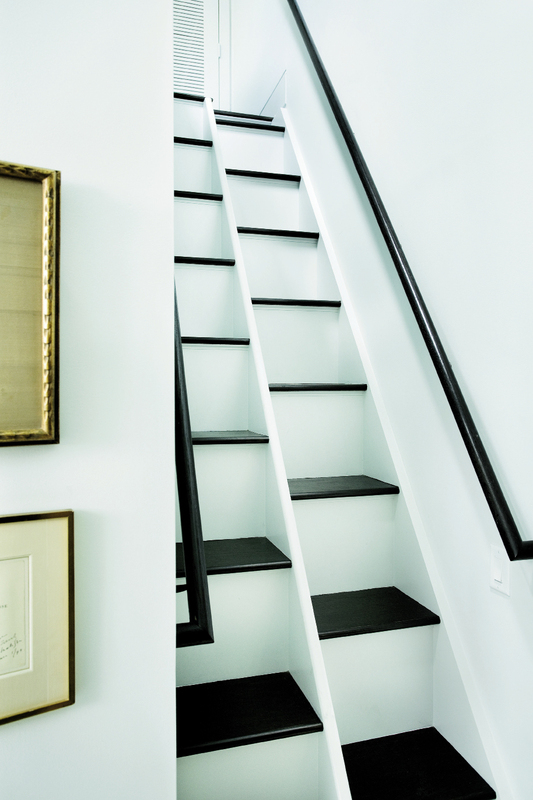 Even the folded metal-plate stairs, a strong design focal point, are softened by natural bamboo treads. Art, mixed with a few magic tricks—solutions Chris pulled out of his hat to solve puzzles they encountered along the way. For example, above the master bedroom was a perfect spot for Kathleen’s office, but there was precious little space in the design for stairs to access it. Unless, like Chris, you recall a design for steep, ladder-like steps first engineered by Italian architect Carlos Scarpa in a museum in Venice. And how to keep that dynamite deck out of sight of the neighbors (just 40 feet away)? Chris set the main rectangular structure at an angle, so that the master bedroom wing serves as a protective flank for their outdoor space. The furnishings simply echo Chris’ subtle melding of form and function, style and texture. A central dining table—made from an old train trestle—is crafted of wood sandwiched between burnished steel. Painted copper floor lamps flank the stone chimney, while a structured Cantoni sofa and mod chaise are offset by a bird of paradise plant in a sunny corner of the living room.